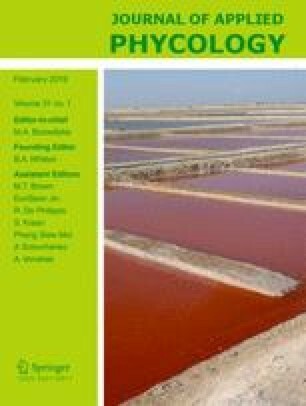 This study demonstrates the effects of growth stimulators in oceanic sediment on biomass and lipid production of two oleaginous microalgae, Botryococcus braunii LB572 and Phaeodactylum tricornutum B2089. At the optimal mixing ratio of culture medium and oceanic sediment extract of 6:4 (v/v), specific growth rates of B. braunii LB572 and P. tricornutum B2089 increased 13.0- and 11.3-fold, respectively, compared to a sediment-free medium. The maximum biomass and lipid productions of B. braunii LB572 were 5.54 and 3.09 g L−1, and those of P. tricornutum B2089 were 6.41 and 3.61 g L−1, respectively, indicating that biomass and lipid production in both microalgae increased at least 6- and 8-fold, respectively. Thus, their cultivation time was reduced by at least 6 days. A positive effect of nitrate in the sediment on biomass and lipid production was not found. Fe3+ and Ca2+ promoted biomass and lipid production as their concentrations increased. However, metal ion concentration is not as critical to biomass and lipid production as humic acid, a chelating substance to enhance bioavailability of metal ions to the microalgae. The optimal humic acid concentration for maximal biomass and lipid production was 80 mg L−1, which is the concentration contained in the culture medium mixed with sediment extract at a ratio of 6:4 (v/v). Thus, low-cost oceanic sediment can supply sufficient growth stimulators, especially humic acid, for mass production of biomass and lipid in both microalgae. This work was supported by research grant of the Ministry of Science and ICT (NRF-2015R1D1A3A01020290) and partially by the Research Fund of Chosun University (2014), Republic of South Korea.